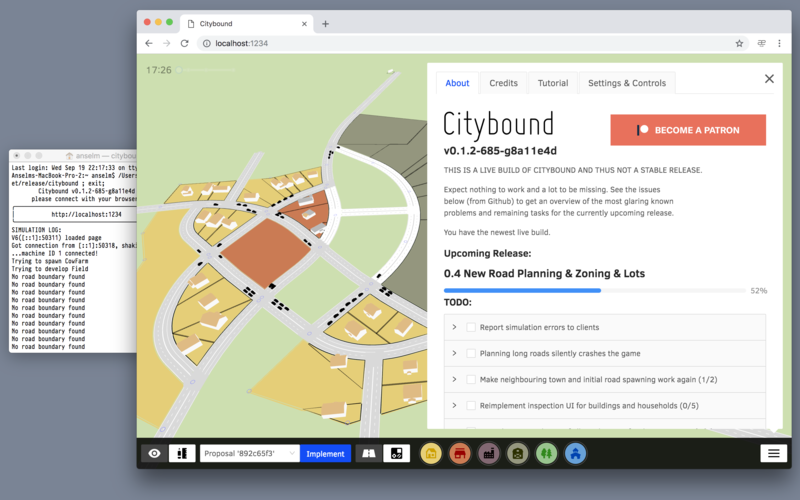 I'm working on Citybound almost every day. And I've reached a point where almost every day there is visible progress of some kind, which is a huge improvement in terms of how development feels to me. On another note, I hugely enjoyed the asynchronous, but very lively discussion and iterative design we did in the Citybound subreddit on how zones could look. This made me think, wouldn't it be nice if we could have the same kind of discussion and tight-feedback design loop around the actual, working game? I reconsidered my decision to only release major, (somewhat) stable increments of the game. The two main motivations for that were that releasing for all three platforms was actually quite a hassle that I didn't want to do too often, and that I still had to work on lots of huge foundational topics where there would be no visible change for up to months. Both of these arguments don't really hold anymore with the simulation part of the game being almost free from cross-platform differences and the web UI being cross-platform by default - as well as me having reached a point where I can work "on the living patient" and having a Citybound that has all the basic architecture, that always mostly runs and just slowly gets more and more features. This is why I decided that, in addition to stable releases marking the completion of major topics, I want to continuously release live builds, which are automatically compiled and released for every single code commit that I do, i.e. the smallest documented unit of change I track when developing Citybound and for all three platforms. This means that ideally the newest release is never more than an hour older than my latest changes. In addition, I decided to make best use of the web UI and include a direct communication channel for development process through the game itself: As you can see in the screenshot and when running the release, the "About" menu screen includes a progress tracker connected to GitHub issues giving you an overview of my TODO and DONE items. It also lets you know if there is a newer live build available than the one you're currently running. I hope that like this I can give all of you an opportunity to not just follow but participate in the development process much more directly, while still keeping expectations regarding stability and polish clear in contrast to stable releases. Get the latest live builds here. I'm really looking forward to see what you think and can't wait for your feedback, bug reports and just the knowledge that people out there are actually interacting with what I put so much effort and passion in, while having a much more concrete, actual version of the game to improve together. I'm sure there will be lots of broken, missing and mis-designed stuff that you discover as well, but this, too, can't happen soon enough.